In my previous entry, I mentioned Loituma in the context of being an "one-hit wonder", due to their well-known song "Ievan Polkka" (often misspelled as "Levan Polkka" or "Leva's Polka") that became an internet meme in the 2000s. A lot of people got an unfortunate perception of Loituma being a joke band because of that song, which is completely untrue. Actually, Loituma were one of the best 90's nordic folk collectives, and they have released two full-length albums before the "Ievan Polkka" single. Here's one of these albums, released in 1998. If you expect to hear danceable a-capella songs like "Ievan Polkka" on there, you're going to be disappointed - but it's strongly recommended if you like melancholic acoustic folk (without the prefix "neo-") with female vocals, and especially if you enjoy the sound of kantele. 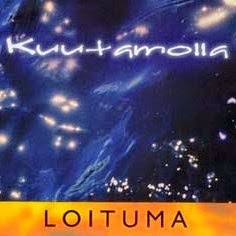 The best track on "Kuutamolla" in my opinion is "Nuustielle", but the rest of the album is nice too, especially two last tracks. Visit the comment section of this excellent blog for the music.